United Nations negotiations for a legal agreement to prohibit nuclear weapons resumed in New York on June 15. The negotiations look set to achieve the adoption of a historic nuclear ban treaty on July 7. However, States in the negotiations are struggling to find agreement on elements of the treaty that could impact most on the policies and practices of the nuclear-armed States. Nuclear-armed States and those under extended nuclear deterrence relationships, with the exception of Netherlands, are absent from the negotiations. Netherlands is not expected to join the final treaty. This simplifies the negotiations, as they involve getting agreement from non-nuclear States to prohibit, in their territories, weapons which already they do not support, possess or host. As such, it is expected that the treaty will be concluded and ready to adopt on July 7, the final day of the negotiations. In general, the treaty will not affect the policies and practices of the nuclear armed States and their nuclear allies, as long as they remain out of the treaty. However, there are a number of proposed elements of the draft treaty which could impact directly on them. Agreement on these proposals is proving to be difficult to achieve. They include proposals to prohibit the transit of, threat to use, and financing of nuclear weapons. Some States and NGOs have proposed that the treaty should prohibit the transit of nuclear weapons through their territorial waters and airspace. States supporting such a ban say that it would be contrary to the purposes of the treaty to ban nuclear weapons in general, but then allow nuclear armed ships and aircraft into one’s ports, territorial waters, airports and skies. States opposing a ban on transit argue that it would be impossible to implement, verify or enforce such a prohibition. They argue that the nuclear armed States are not transparent about which vessels (ships, submarines, airplanes) are carrying nuclear weapons, and whether vessels carrying nuclear weapons are transiting the waters and airspace of other countries. 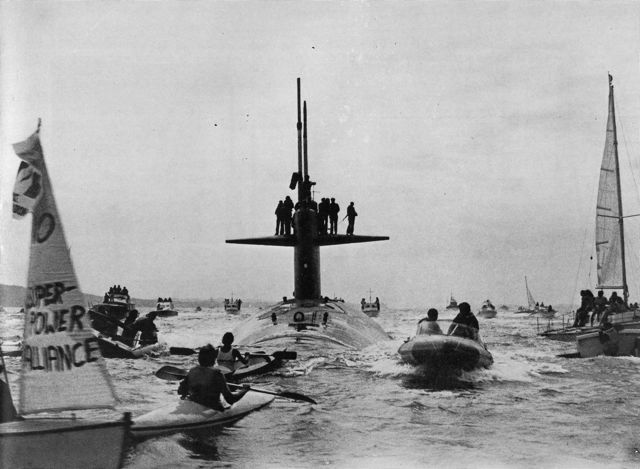 However, the experience of New Zealand, which prohibited nuclear weapons in 1987, indicates that it is possible to ensure compliance with a nuclear weapons prohibition on ships, submarines and airplanes making port visits or landings in one’s territory. A prohibition on transit through territorial waters and airspace might be able to be adopted without requiring verification. For a more in-depth discussion please see The ban treaty, transit and national implementation: Drawing on the Aotearoa-New Zealand experience. The threat to use nuclear weapons is central to the policies and practices of the nuclear armed States and their allies. Nuclear weapons have not been used in wartime since 1945. Indeed, nuclear armed States have affirmed that the core function of nuclear arsenals is not to use these weapons, but to prevent their use through nuclear deterrence, i.e. the threat of their use. A nuclear ban treaty which is silent on the legality of the threat to use nuclear weapons would therefore provide little challenge to nuclear deterrence policies of the nuclear armed States and their allies. Despite (or perhaps because of) this, there is reluctance by a number of the negotiating States to include in the treaty a prohibition on the threat to use nuclear weapons. The initial draft of the treaty did not mention threat of use. Advocacy by some governments and NGOs, including the International Association of Lawyers Against Nuclear Arms (IALANA), has managed to get an affirmation of the illegality of the threat to use nuclear weapons into the preamble of the revised draft. (See IALANA: Ban treaty should affirm the current illegality of the threat and use of nuclear weapons). However, it is uncertain whether a prohibition on threat to use nuclear weapons will make it into the principal obligations in the final treaty. On June 22, IALANA released a Lawyers’ Letter on the abolition of nuclear weapons, endorsed by over 400 members of the legal profession, highlighting the need to codify in the ban treaty the illegality of the threat and use of nuclear weapons. UNFOLD ZERO, PNND and the Basel Peace Office are campaigning to include in the ban treaty a prohibition on the financing of, and investments in, corporations manufacturing nuclear weapons and their dedicated delivery systems. Nuclear-armed states currently spend US$100 billion collectively on nuclear weapons programs annually. The corporations manufacturing the weapons and their delivery systems are a major driver of the nuclear arms race. They actively lobby their parliaments and governments to continue allocating the funds to nuclear weapons. And they support think tanks and other public initiatives to promote the ‘need’ for nuclear weapons maintenance, modernization or expansion. Many non-nuclear States support this through public funds which invest in nuclear weapons corporations, and by permitting banks and other financial institutions in their countries to also invest in these corporations. If all of the Sates joining the nuclear ban treaty divested their public funds from these corporations, and disallowed banks from investing in them, it could radically change the economics of the nuclear arms industry. It would damage the credibility of and investor confidence in corporations manufacturing nuclear weapons. And it would give support to efforts of parliamentarians and civil society in the nuclear arms States to cut the exorbitant nuclear arms budgets and re-direct these funds to health, education, jobs, environment and sustainable development. A number of States participating in the nuclear ban treaty negotiations have supported the proposal that the treaty prohibit financing of, and investments in, nuclear weapons. However, other States argue that this would be too difficult to implement, despite the fact that a number of countries (Lichtenstein, New Zealand, Norway and Switzerland) have already implemented nuclear divestment policies. UNFOLD ZERO, PNND and Basel Peace Office submitted a working paper to the UN negotiations on this issue. In addition, we held a press conference and addressed an informal session of negotiating States at the UN in Geneva on June 1-2, and gave an Intervention on financing of nuclear weapons to the UN negotiations in New York on June 19. The final ban treaty, which we expect to be adopted on July 7, will provide support for nuclear divestment regardless of whether it includes a specific prohibition on financing of nuclear weapons production, or a more general prohibition on assisting nuclear weapons production. We therefore plan to launch a global nuclear weapons divestment campaign following the adoption of the treaty.